Last night was our closing program, awards ceremony, and graduation. It was a big night, and the students did a great job with their presentations. Miss Summer's class, Kindergarten and first grade, sang a song about Creation, with flowers growing and everything, then followed it up with "The Wormy Song," both of which were adorable. Grades four through high school sang several songs about water and recited 1 John 1, then received their awards. The two graduates, Mr. Anthony Y. and Miss Abigail S. gave their speeches (really good speeches, with good memories, and good advice for their classmates) followed by our guest speaker, Mr. Ernie K. His commencement message was full of wisdom for all of us, and he did a great job presenting it. Our Administrator, Mr. Bill Y., presented the graduates with their high school diplomas, then called Miss Resha and Miss Summer to the stage for a formal farewell. He expressed the appreciation that we all have for the excellent work that these two teachers have done with our children, Miss Summer this year, and Miss Resha over the last four years. The school board also presented them with gifts by which to remember our school. We wish them the very best as they go on to new adventures! We were back at the school house this morning by ten o'clock for softball games, then enjoyed a lunch that was organized by our hard-working school board. After lunch, the fathers and sons faced off in what turned out to be an epic softball game. The dads jumped out to an early lead, discouraging the sons. By the sixth inning, the sons were turning it around, pushing the game into a tie-breaker that lasted two hard-fought innings before the sons slammed a couple of long hits that drove base runners around to home... and that was it; the final score was 14-11. The sons won! This year. Have a great summer, everyone! "My tooth is turned around," he said. "Do you want to pull it out?" 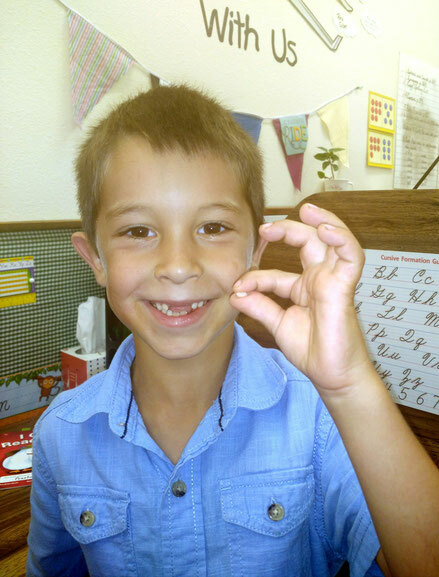 First tooth pulled at school in Miss Summer's room! Then the lights went out. And the students cheered. Humph. For a little more than half an hour, the electricity was out, so not much work got done. Because the room was dark! Kind of. 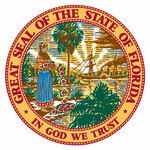 We reported it to FPL for repairs, and their website said 1,717 homes were without power. 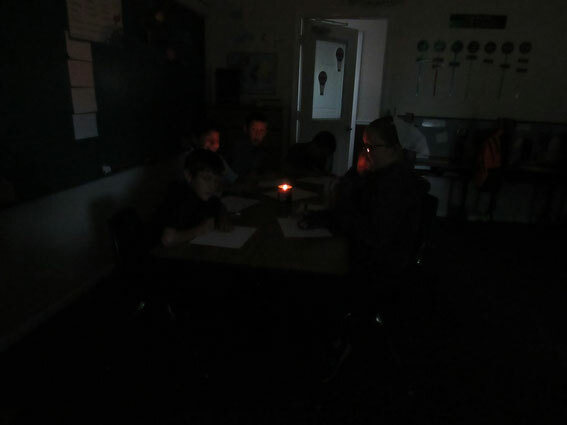 The teachers were glad when our electricity was restored. NOTE: Miss Summer is away for the weekend; as part of Oasis Chorale, she will be presenting at the Why Jesus? conference in Bangor, ME, this Saturday, May 7. The program will be live-streamed, which is the only way to see her singing, because the 6,500-seat venue is sold out. As you can see in our lights-out photos, Miss Kristin is substituting for Miss Summer while she is away. Today, Ruth G. had a great surprise for the younger students, and they thoroughly enjoyed it! She set up a small store in the Fellowship Hall for grades K - 3 and had everything priced. The kiddos had about $5 each in play money and they got to visit her store and "buy" things. It was exciting for these students, and they will remember it for a long time! Thank you, Ruth! You can see several pictures here. The end-of-year field trip is always eagerly anticipated, and this year was no exception. The students were excited about going to Busch Gardens! We left the school house around 8:30 am, and arrived safely just before they opened. After getting our tickets, it was full steam ahead. Younger students enjoyed Sesame Street friends (a first-grader said, "We spent three hours there!") while the older students went straight for the roller coasters. It was a warm day, so the water rides felt good: both the Flume Ride and Congo River Rapids were an excellent way to cool off. For those of more sedate pace, the cable cars were an opportunity to relax, but the younger set filled the queues for Cheetah Hunt, SheiKra, Montu, and Kumba. The Montu roller coaster in particular was a real beast. Respect. We left the park around 5:00 and headed to Cici's Pizza, where the students jumped in and loaded up on their favorite pies. Of course, the cinnamon rolls were very popular, too. The younger students tried their skills at the vending games, while the olds rested up for the trip home. We arrived back at the school right on time, around 7:00-7:15. It was a good day for everyone, even for the students who didn't always feel too well. The school board did a great job of organizing the day; it's a lot of work, but because of their good planning, everything flowed nicely. Thank God for the blessing of safety and protection! Monroe M. was our guest speaker for chapel this morning. He brought a police officer and a deputy sheriff with him. 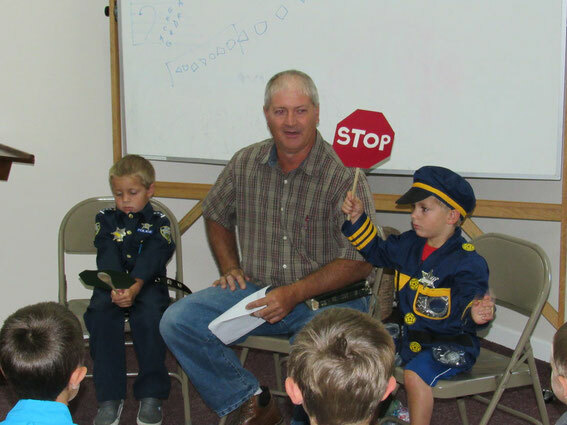 The theme of his chapel talk was about how God gives us "STOP" and "GO" instructions for life: things we should be doing, and things we should not be doing. It was very interesting, and his sidekicks did a great job, too! 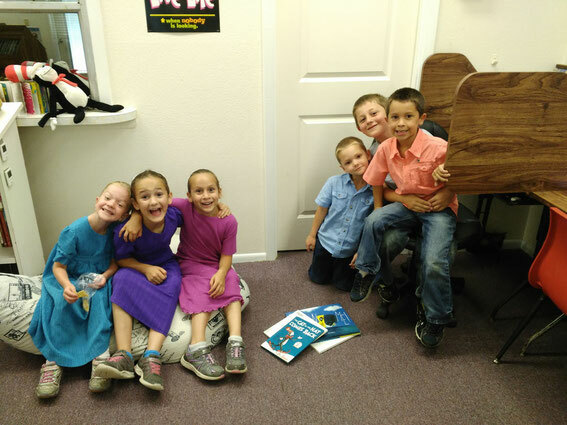 While Mr. Jason's class was gone on a field trip all day, the classroom was empty, so Miss Summer's students took advantage of the opportunity: to put it in her words, "When the cat's away... the mice have story-time in his classroom!" Miss Summer also says, "When my sister Nora was here she went along with us to the library and took these pictures while we browsed!" They took us to the booking area and showed us where they do initial searches and process personal possessions of people who were arrested. We saw the holding cell where they put people who are uncooperative, and Vanessa G. even got to sit in the rolly-chair that they strap people into when they get violent and need to be restrained. We went up to levels two and three, and visited the cell blocks where inmates are being held, either awaiting a court hearing or transfer to a prison. Every new section of the jail meant walking through a locked-down area into another locked-down area, with doors ahead of us and behind us clanging shut, locked at all times except for authorized passage. They also showed us the kitchen, with trustees busy either preparing food or cleaning after food prep. 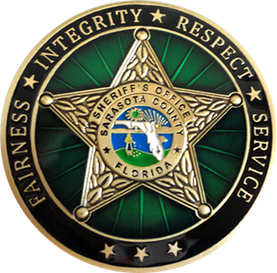 They jail holds about 1,800 inmates, but the Sherriff's Department is proud of the fact that they have programs in place to modify behaviors and prepare inmates for productive civilian life -- which helps keep jail population down. We were showed the chapel area, which holds about 50 chairs and is used both for chapel services and for AA and other self-help/self-improvement programs. Administration has a list of about fifty religions that are authorized for recognition in the chapel system. Adjacent to the North Cell Block, Sgt. Vajdik and Sgt. Darling took the students into a recreational area that included one basketball hoop, two lumpy, misshapen basketballs, and four handballs. The basketball hoop was raised (for safety reasons) to 12 feet rather than the standard 10 feet, but Sgt. Vajdik said he personally saw an inmate dunk on the 12-foot-high hoop! After the jail tour was finished, we went to the 10th Street boat ramps for awhile, and the students explored the shoreline, climbing on rocks, skipping shells, and finding treasures. The vote carried strongly to go to Chick-fil-A for lunch, after which we went to Colonial Oaks Park gymnasium for basketball, Extreme Indoor Kickball, and a newly-invented game which we shall hereafter refer to as Volley-Basket. We ended the day with Slurpees. Fun Days! Who doesn't like them? 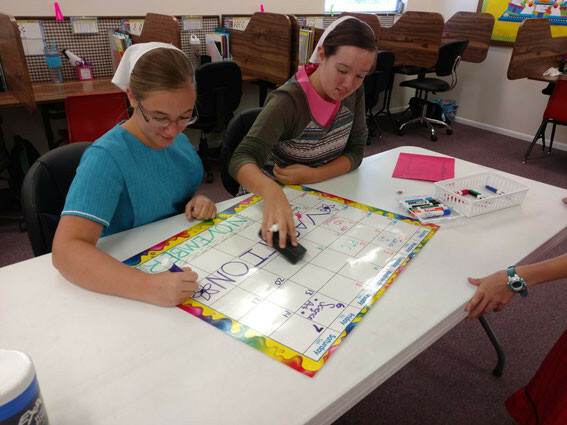 The students in grades 4 - High School had several fun days recently, with lots of games and good times. Click here to see pictures and a video. 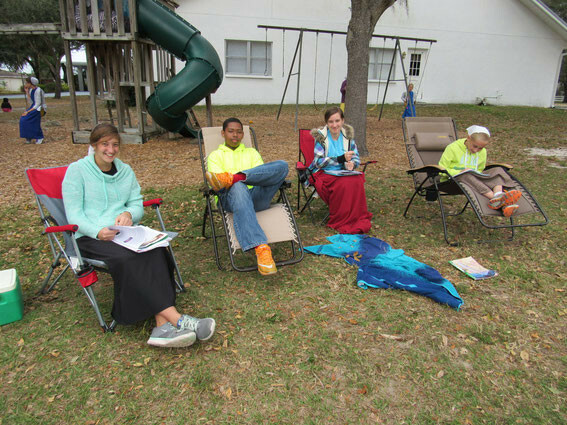 On Tuesday, the students were allowed to study outside: the weather was perfect! 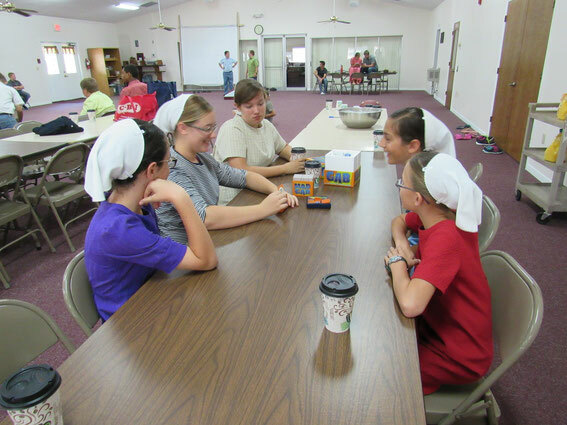 Wednesday was flip-flop day, and they played games in the Fellowship Hall during part of the forenoon: Human Dutch Blitz, Corn-hole, and table games. This was all fueled by iced coffee and orange juice. On Thursday P.E. began a half hour early to make time for an Ice Cream Party: six flavors of ice cream plus all the toppings you could hope for. As you can imagine, the students enjoyed it. A lot. 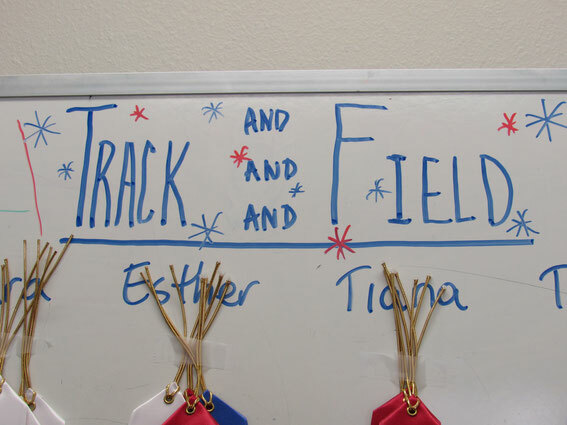 Track & Field was held today, under blue skies and sunshine. The fresh breeze kept us all comfortable as the students ran and jumped and skipped and threw, competing in nearly a dozen different events. They showed admirable character as they cheered for their competitors; it was clear that they did their very best to win, but they enjoyed friendly competition in all of it. The school board put together a tasty lunch of pulled pork sandwiches with crudités and dip, complete with brownies and ice cream for dessert. Fresh mint tea was the perfect complement to the meal. Thank you all for coming to enjoy the day with the students: your presence made the day more special for them. 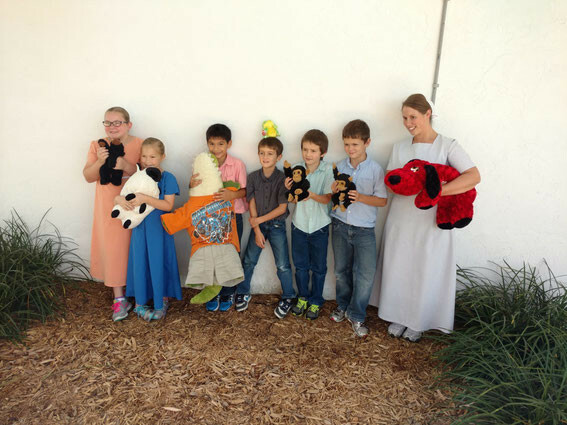 Dress Up Day: Grades K - 3 wore their best costumes today! From a president to a construction worker, an American Indian to a pirate, a hippo to a monkey, and even more great ideas -- they had a fantastic time together. Plus also, you should see Ms. Frizzle and her co-teacher from the 1950's! Wow. Your Honor students went on their Honor Roll Field Trip today, to the T. Mabry Carlton Water Treatment Facility in Venice. We arrived around 9:15 this morning, and after taking a group photograph in front of the main offices, Jim welcomed us inside. Jim is the Chief Treatment Plant Operator, and he gave us a complete tour of the entire facility. 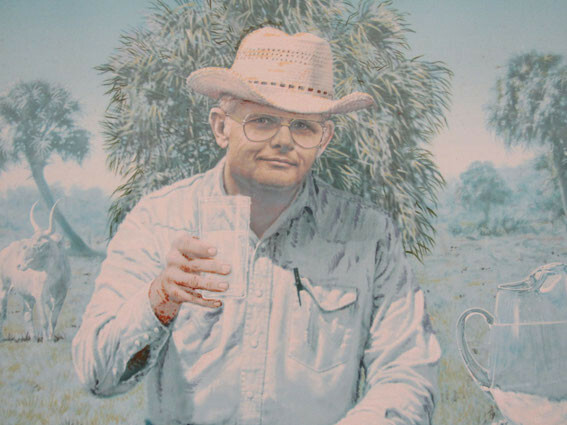 He explained that this facility provides drinking water supplies all over Sarasota County. Some of the water comes from many wells on the Carlton Reserve, and some is piped in from the Floridan Aquifer. He also mentioned that this filtration system is the second-largest in the United States, after one in Texas. They process around 15 million gallons per day, and have three reservoirs that hold about five million gallons each. You can join us on the tour by clicking here. After the tour, the students made it clear that they preferred Chick-fil-A for lunch; then we spent the afternoon in the Colonial Oaks gym, playing basketball, Extreme Indoor Kickball, and Eight Square. We ended the day with Slurpees at 7-Eleven. Miss Summer's class has been doing some fun things recently! She says, "We had stuffed animal day on Feb. 10. Our stuffed animals did everything with us that day. 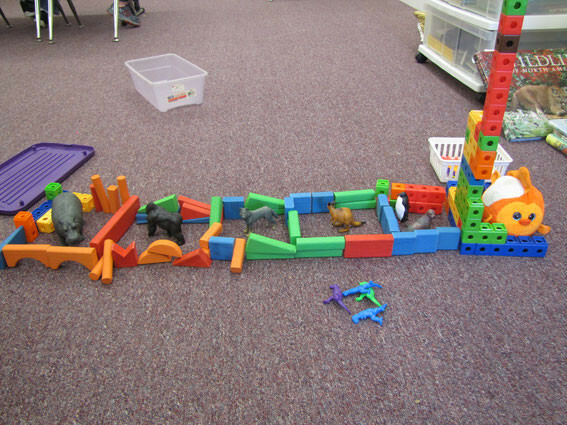 Caleb's stuffed fish even got it's own pen in a zoo the Kindergartners built! "And on Feb. 18 we had No Shoes day... except for when we went outside!" Sounds like fun! Click here to see several pictures. 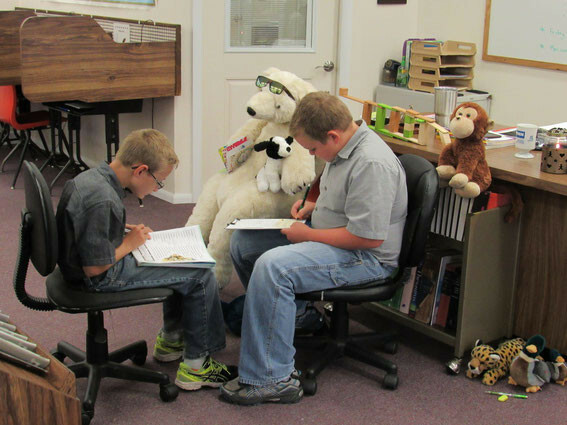 Two students completed their school work this week, finishing 13 years' worth of work. Anthony Y. took his last test on Monday (an English test), and Abigail S. successfully passed her final three tests (English, U.S. Civics, and Speech) on Friday. They have been working hard to get it done, and we are happy for them and proud of them, but we will miss them in our classroom. 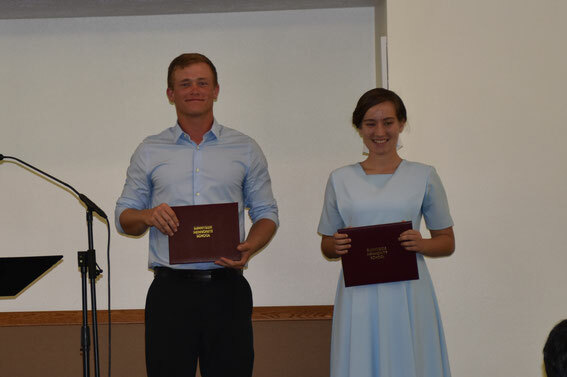 Both Anthony and Abigail are quality young Christians, and provided valuable examples and leadership to the younger students. We are confident that they will continue to be successful in whatever work God calls them to, and we wish them the very best! 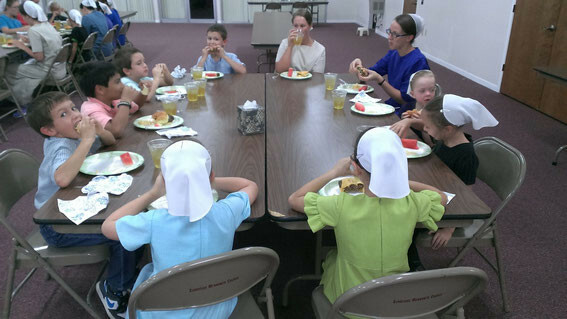 This evening was our 8th Annual Fundraiser Banquet, held in the Fellowship Hall. 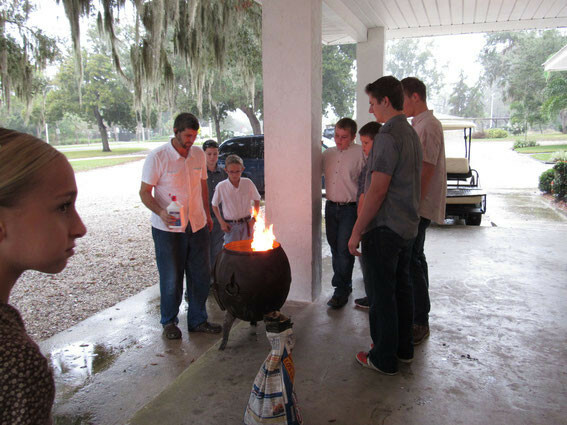 The school board worked hard to get everything ready, and Alvin Zook spent hours barbecuing the pork, chicken and potatoes. The food was delicious, and the evening was made even more enjoyable with special singing by the Nathan OVerholt and Matthias Overholt families. Also, the board chair, Gary Y., had a basket full of prizes that were handed out in a random ticket drawing. The students did a great job serving our guests, refilling water and coffee, and making sure everyone got a serving of the excellent dessert, Strawberry Shortcake. The school board was busy in the kitchen, along with some youth that they drafted for the work. We are grateful to everyone who participated in the work, and many thanks to our guests who came and donated funds to support our school! 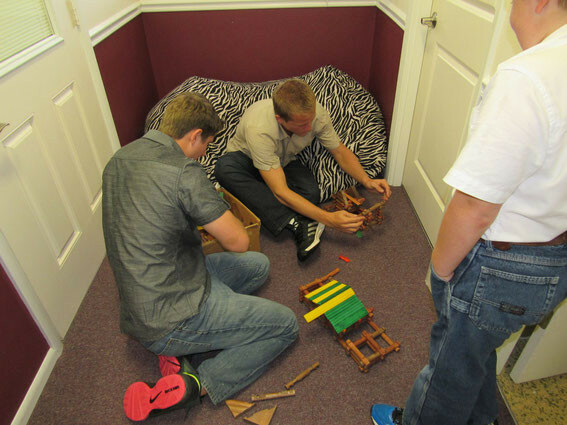 The students in grades four through high school had a very good time while Mr. Jason was away this week. Ms. Angi planned several fun days, and the week kicked off on Monday with Name Tag Day. The students suggested a long list of names to choose from, then each student randomly drew one of those names from a bowl. These are some of the names they used: Gertrude, Penelope, Pollyanna, Beatrice, Georgina, Marta, Gavin, Bart, Oliver, Earl, Phoebe, Thatcher, and Leonard. On Tuesday they brought beach towels and lawn chairs along to school, and everyone studied outside. It was a cold day, so they bundled up in the wind. You can see pictures if it here. Wednesday was Clash Day, in which they dressed in the worst possible fashion. They did a great job, too. It was awful! 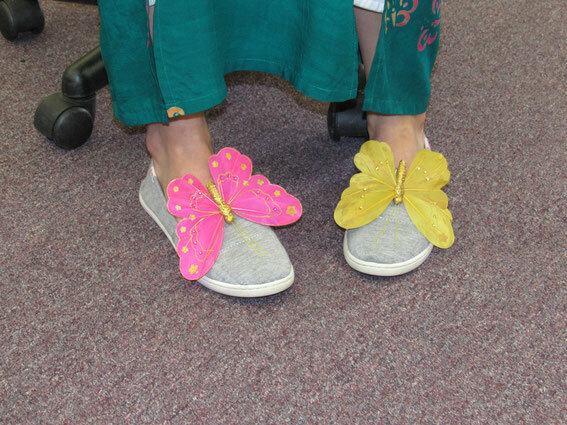 Everything from mismatched shoes and socks to a "flamingo" headband was on display, and we are glad they don't dress like that every day! 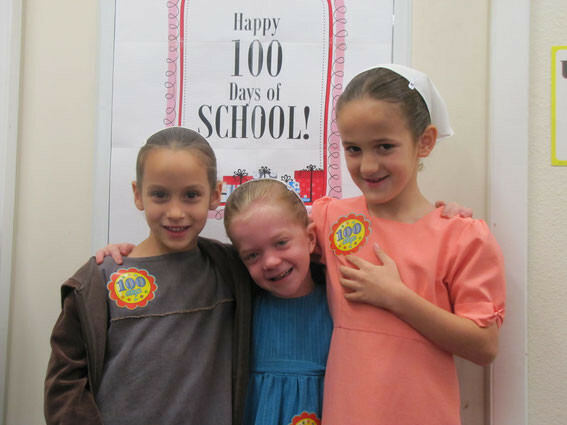 One Hundred Days of school! That's the milestone that Miss Summer's class celebrated today, with art projects and all the fun things. 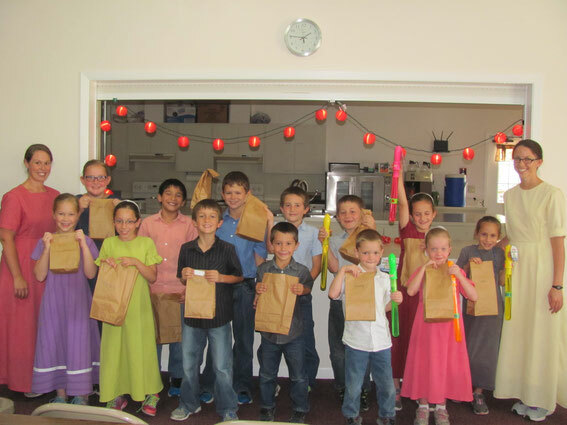 Click HERE to see photographs of their activities. Don't you wish you could be a student in Miss Summer's class? They had a great time! Today, Miss Resha's students were treated to a special surprise when they walked into their classroom! 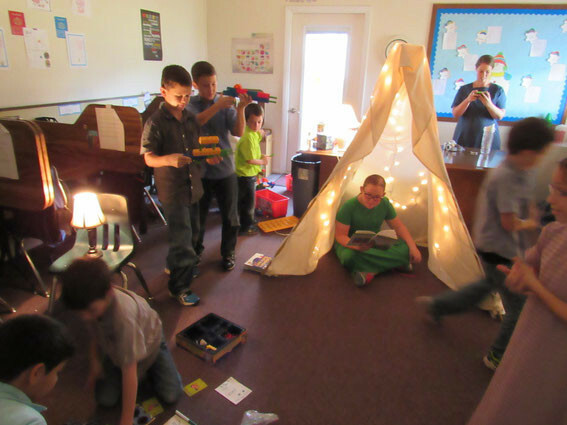 Their teacher set up two tents, and ran strings of lights around the tents. One tent was for the ladies, and the other was for the men. They studied in the tents during the forenoon periods, which was great fun. In the afternoon, Miss Resha turned out the classroom lights and turned on the strings of lights and the lamps, and they played and read books. Our annual Christmas Program was held this evening in the church house auditorium, and the students did really well in all their presentations! They arrived for final preparations by 6:55, and gathered in the school house for program review. The service began at 7:30; after a couple of congregational songs led by board member Dave Y., board member Joseph G. gave a devotional meditation. Then the lights went down, the students filed in and took their places, and the program began. 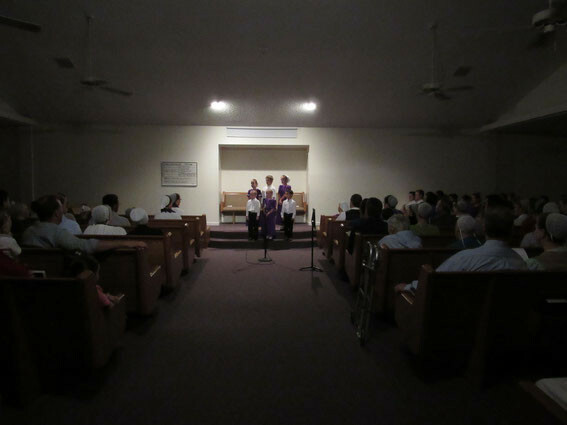 From Scripture memorizations to poem recitations and singing, it was plain to see that they poured their hearts into it. The younger students were particularly vigorous in their singing, while the older students being a bit more reserved also sang beautifully. School Administrator Bill Y. closed the service with encouragement for the parents, compliments for the students, and a reminder that the time for childhood training is brief; we only have one chance to get it right. He offered a benediction, and the students promptly began their Christmas vacation while the parents were distracted with visiting. Christmas blessings to you all! Christmas brings excitement to our classrooms, and today the older students had a party, with snacks and drinks and even a fire for roasting marshmallows! Here are some pictures. The fire was built out back, just before the rain came to drown it. A chimney-pot was offered by Vanessa's dad, and that was quickly set up on the front porch, where a nice, hot fire made delicious S'mores. In the class room, a couple of tables were loaded with chips and pretzels, rice crispy treats and Li'l Smokeys, cheese chunks and pickles and Moon Pies and Mt. Dew and Coke and Orange soda and Root Beer and candy canes -- oh my! So. Much. Food. It was a feast! A drawing was held for a Christmas coffee mug, and Isaiah M. won! After everyone was satisfied, the students pitched in and helped clean it all up. They certainly had lots of energy. Now the class room is silent. Have you ever heard of Access 19? 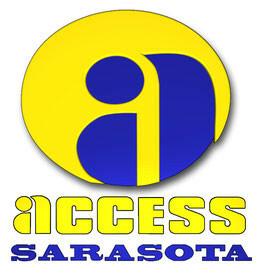 That is the name of the Sarasota County communications department that produces broadcasts reporting on the work of the county commissioners, hurricane preparedness, county parks developments, beach re-nourishment programs, and, essentially, any and all of the county's business. Today, your honor students enjoyed a guided tour of their production studios. We arrived at the Sarasota County Administration Center in downtown Sarasota on Ringling Blvd. at about 9:00 this morning, where we were met outside the front door by Jack, who was sent to welcome us by the director, Jamie Carson. Jack told us what we would be seeing and doing, then led us inside and up to the third floor, where Ms. Carson gave us an official welcome to Access 19. We went straight to the studio, which was remodeled just a few weeks ago. The whole set, including the soundproofing, curtains, and cameras, is all new. Steve, the photographer, gave us explanations and demonstrations about his job, with some students even sitting for a government-style personal portrait. He showed us how powder, concealer, and make-up is applied so that folks on camera don't have a shiny, glistening face. Across the room, James showed us the reporter's desk and the green screen, which the students thought was great fun. One of our ladies, Vanessa G., wore a green dress purposely, so we could see the effects when standing in front of the green screen being filmed. James even did a "magic" trick, pulling stress-balls out of a box that disappeared in front of the green screen, and tossing a ball to each of the students. It wasn't long before Jack had the younger students in the control room running the cameras, zooming and panning, while several high school students were on set, wearing communications head-sets and "videoing" the lady "reporters" at the desk. When we exited the control room, they had a snack waiting for the students: apple and strawberry pastries with orange juice! Our next stop was a large conference room that is used for training and educational functions, then we went to the theater-style chamber where public sessions are held with the county board of commissioners seated on the dais. Here we also crammed into James' A/V control room, where he runs things behind the scenes for commissioners' meetings. After thanking Jack for the excellent tour, the students circled up in the first-floor foyer where they voted overwhelmingly for a Chick-fil-A lunch. After lunch we went to Colonial Oaks Park, where the students played basketball and Extreme Indoor Kickball. We left just in time to go to 7-Eleven for Slurpees, and arrived at the school house minutes before three o'clock. It was a really good day. 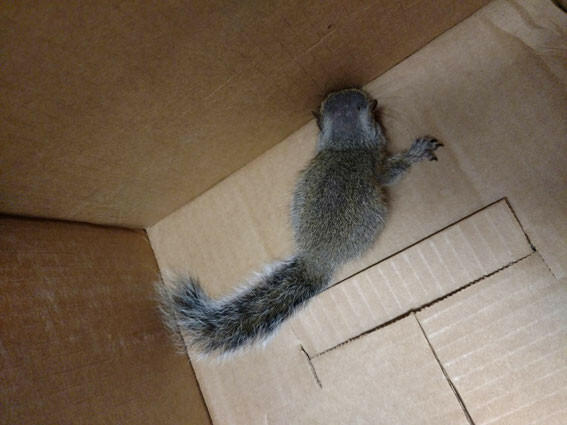 She is an Eastern Gray Squirrel, sciurus carlinensis. Abriana K. found her just before school started, lying motionless on the sidewalk. Apparently Beatrice fell out of the oak tree, and suffered a mild to severe concussion. 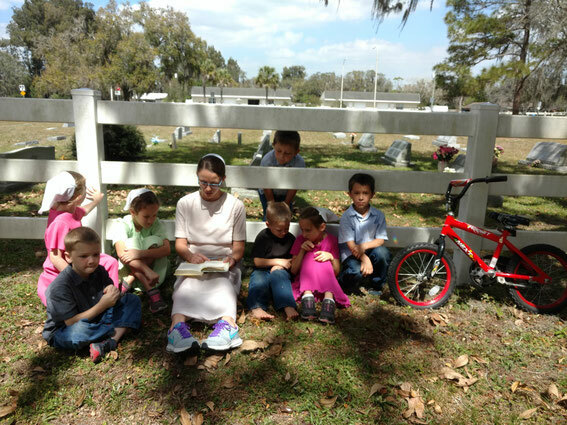 Abriana hollered for help, and soon Beatrice was bundled up in a rag, listening to the students sing a modified chapel song for her. It was not long after the song that we noticed she was feeling a little better. At break time, the two high school men, Tyler G. and Anthony Y., took Beatrice out to show her to the younger classrooms. After show-and-tell, Beatrice spent most of the break resting quietly in Anthony's shirt pocket. We hope Beatrice makes a full recovery, and we wish her well in her future endeavors. 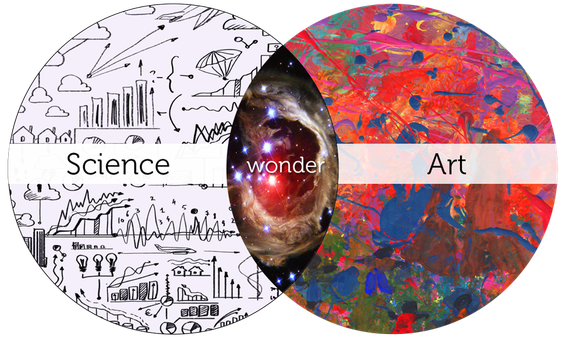 Our annual Science & Art exhibit was held this evening, and the students brought some pretty amazing creations to show us. They brought woodwork and string art, crocheted pieces and hand-drawn artwork, chemistry and electronics and handcrafts and even a robot or two! It was great! 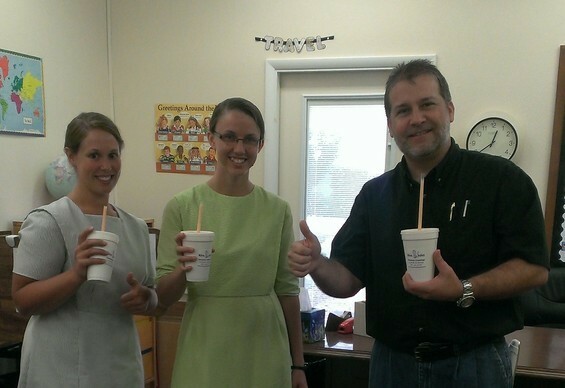 The school board supplied a pizza supper which was very tasty, complete with drinks and dessert. 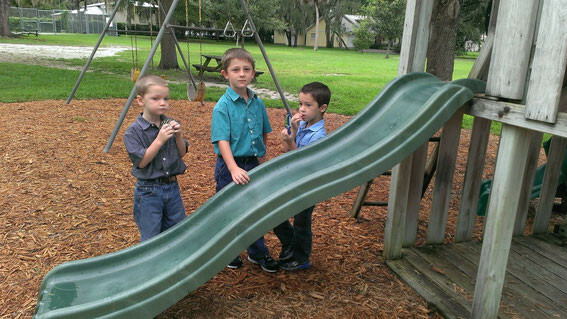 The students ran and played, in and out of the building, in and out of their classrooms. Candies were given away in a guessing game, and Skittles were passed around in celebration. Yearbooks were bought, which brought back lots of good memories. Everyone went home tired, except the winners of the candy. It was a good evening. 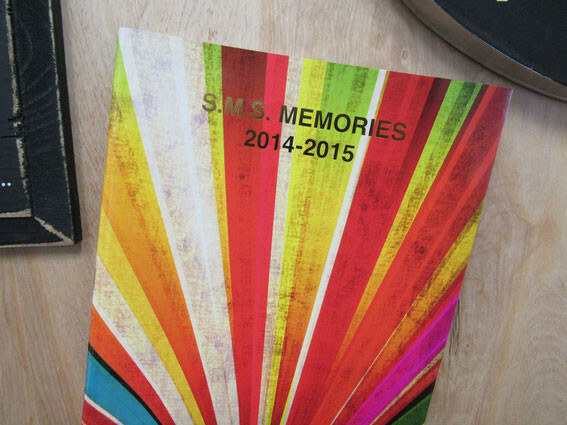 THE 2014 - 2015 SMS YEARBOOKS ARE HERE! Copies are available now, for only $10 each. Get a copy for each of your students, one for mom and dad (you can share), and don't forget grandpa and grandma! The cost is kept low in part because of our generous yearbook sponsors, so please thank them for their support, and use their products and services! It's already time to change the calendar for November! Miss Resha's sister Lori was here for a week, and spent lots of time with the second and third grade students. She helped with things like flash cards and reading circle, but it wasn't all work! They also found time to organize a Teddy Bear Day, a walk to 7-Eleven for Slurpees, and other fun stuff! We were all glad to have Lori here with us, and the students liked having her in the classroom, but Miss Resha was most thrilled to have little sister here with her. Miss Resha could frequently be seen with an enormous grin, just enjoying the special-ness of family. It was a week that went by very quickly. The Honor Roll students had their field trip today! They began the day at Pinecraft Shoe & Repair, where Mr. Lee K. welcomed us for a tour of his leather goods and repair services. He showed the students a variety of handmade leather products, including several brands of work boots. This is where the students learned how difficult it can be to get custom saddles delivered for display in his store. 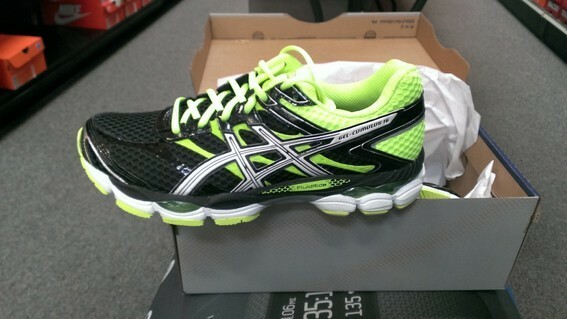 Next he showed them the stock room, jammed with shelves stacked high, full of boots and shoes. At one end of the stockroom he had a space full of pieces of leather, large and small, in lots of colors, textures, and variations of thickness and suppleness. From there he took them into the repair area, where he introduced them to his machines. Stitchers, sanders, cutters, and stretchers - he has everything he needs to get the job done right. He had several pairs of footwear in different stages of disrepair, which he proceeded to tear apart, glue, cut, and stitch back together. It was very interesting, and the students enjoyed watching him work and hearing his stories. One of his machines, a chain-stitcher, was in his other shop, so we went over with him to watch him chain-stitch soles onto Blundstone #500 paddock boots. Before we left the store, however, he gave everyone a leather gift: their choice of a coin pouch, door bell, or key chain. When we were done there, we had a few minutes until lunch, so we walked through the wilderness trail next to Pinecraft Park, enjoying the beautiful, cool weather. While traipsing through the woods, we came across a Sarasota County Parks volunteer named Diane, who was working on clearing the park of the invasive Air Potato weed. She educated the students sufficiently on the evils of the Air Potato, then we moved on to get lunch at Firehouse Subs, which won the vote over Chick-fil-A by only one point. After lunch, the Colonial Oaks Park gymnasium was booked for pickle ball, so we went to Bee Ridge Park, where the students played volleyball in the sand. After several games, they relaxed on the picnic tables and told stories until it was time to leave. We finished our day at 7-Eleven, naturally, and were back at the school house a few minuted before three o'clock. It was a good day. Today is the last day of September. The Kindergarten and First Grade classroom decided they should celebrate that, so they trekked to 7-Eleven for free SlurpeesTM, which was totally worth it. Today is National Teddy Bear Day. Naturally, we felt this day should not go unobserved. The Kindergarten students began their school career today! All three - Mr. Caleb Y., Mr. Preston Y., and Mr. Grady Y. - arrived with nervous smiles, and hurried in to find their desks and put away their supplies. They did really well during class time, sitting straight and alert, ready to follow instructions and please their teacher, Miss Summer. Break time was fun, too! They stayed close to each other on the playground, just munching their snacks and taking it all in. At lunch time, they joined grades 1-3 to play Bum-Bum-Bum, tearing around on the front court and using up lots of energy. The afternoon was a bit more low-key, including doing some artwork in their seats. Soon the end of the day rolled around, and they were eager to head out the door and find mom for a ride home. All in all, it was a good day! Thanks, moms, for trusting us with your little ones. We will do our very best to take good care of them while they are here with us! First Hot Lunch of the year! It was delicious! The first day of school came and went quickly. The students arrived with big smiles and a willingness to work. After getting their gear stowed away at their desks, we headed into the fellowship hall, where the Assistant Administrator, Lester G., had the chapel talk. Using Esther the Queen as an example, he encouraged the students to pursue God while young, and to fulfill the call God has for their lives. Back in the classrooms, it was time to crack open new books and familiarize ourselves with classroom procedures. First break, around 10:00, was rather quiet for the older students, but full of fun for the younger classes. Second period breezed by sooner than expected, and we dismissed at noon. After the students had all gone home, a kind soul had compassion on the teachers and brought us a treat from Keva Juice, which revived our spirits nicely! Thank you! Tomorrow is a day off (already!) because of Laura Yoder's funeral (you can watch her talk about her life experiences here, near the bottom of the page) but we will see you all again on Friday. Orientation was great! Lots of laughter, noisy chatter, children running everywhere: it was great! Students explored their classrooms, finding their friends, their teachers, and their desks. Outside, it was raining. Inside, the fellowship was warm and enjoyable. Thanks to the school board, we were treated to refreshments of sweet tea and party mix, which was a hit with everyone, especially the children. Now the classrooms are quiet; somewhere, a vacuum is cleaning the carpets, lights are blinking out... and the students are gone. School starts this Wednesday - the front door opens at 8:10. We'll see you then! Note: Due to the funeral of Laura Yoder, school is cancelled for Thursday. It's going to be a great school term! Hello, everyone! Things are happening here! The teachers are done with their summer training schedules, and earned their certificates of completion. Miss Resha and Miss Summer have arrived and are hard at work preparing for the new school year. You can see several photos here. We look forward to seeing you all at Orientation on Monday evening at 7:00! School begins next Wednesday, August 19. Did you buy pencils and erasers? Do you have new shoes? Are you ready? The carpets are clean! Thank you, Charles. Lots of hard-working folks showed up for school house cleaning today, and the place looks great! Inside and out, scrubbing and vacuuming, cutting and raking, trimming, washing, repairing... Thank you for your help! We are well on our way to preparing for a new school year! Click here to see pictures. 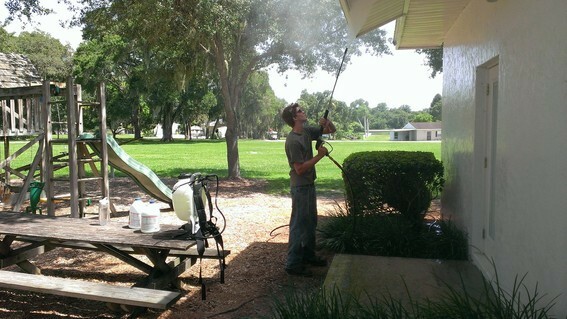 The outside of the school house is being cleaned with a pressure washer today. 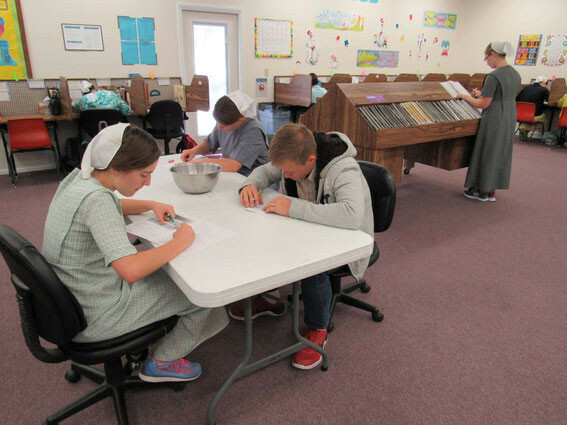 This Saturday, beginning at 8:00 am, will be the annual school house cleaning day. Bring cleaning supplies for work both inside and out. 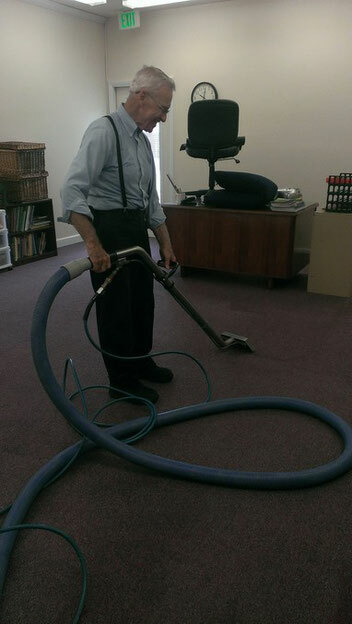 Next week the carpets will be cleaned, and by the first of August, the school house will be ready for the teachers to start preparing their class rooms for the new year. This is a great way for you to stay in touch with your school: just save this page in your favorites menu, and check back frequently. 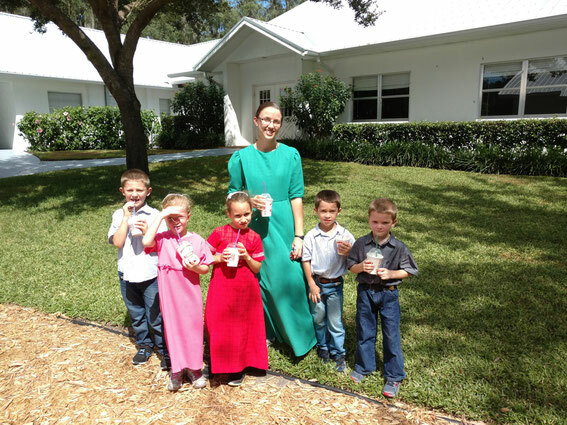 The Sunnyside Mennonite Church School admits students of any race, color, national and ethnic origin to all the rights, privileges, programs, and activities generally accorded or made available to students at the school. It does not discriminate on the basis of race, color, national and ethnic origin in administration of its educational policies, admissions policies, and athletic and other school-administered programs.